Discover how Outsource2india helped a mid-sized law firm to clear the accumulated backlog and bounce back to regular work. Often, law firms of every size tend to neglect billing and accumulate large receivables. Such accumulated back office billing work requires domain knowledge and expertise. We helped one such mid-sized law firm to quickly and efficiently clear their backlog. We successfully handles their paperwork, managed their peak load, and filed all the paperwork electronically. In this way we helped them to significantly cut down on staff related expenses, while appropriately managing the seasonal load. Several small-mid sized law firms often neglect their billing and end up with large receivables. Billing work for them requires some domain knowledge of the legal process in US. 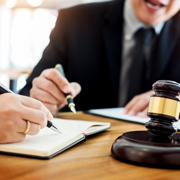 An additional complication arises because they treat each case matter as a separate "accounting unit" and all the costs and incidental expenses need to be accounted for separately for them as it goes into the client billing for that case matter. The law firm specializes in foreclosures, evictions and bankruptcy and a large percentage of their work is to represent the government in such cases. All the paperwork (including every small email) needs to be filed electronically given the nature of the business. The matter has to be opened / setup in the in-house software used for managing the Law Firm Practice. The bills have to be generated as the case matter closes and in majority of cases submitted online to various government offices for claims. In case any payment is held-up due to request of additional information from the Government – the requested info is uploaded so that the payment is released. At Outsource2india, we have been providing accurate and high-quality Finance and Accounting Services for our global customers, enabling them to save on time, effort, infrastructure and revenue. Read more finance and accounting services case studies on Equity Research, Accounts receivable, Bank Loan Production, Financial Research, Title Search and HR Support. Please contact us for further information about O2I’s Billing Services Back office support and Pricing details.